You won’t find better Noosa Heads holiday apartments than the Rise Noosa for your holiday on the Sunshine Coast. Our luxury accommodation includes fully self contained two and three bedroom apartments and freestanding villas situated on the ridge of Noosa Drive just ten minutes walk from Hastings Street. What people really love about the Rise Noosa, is not just the superb views overlooking Laguna Bay, but also for the relaxed beach house aesthetic of the apartments. The apartment facades use corrugated iron, oil stained timber and stone is a reminder of more carefree times when a holiday by the beach was usually spent in a tin or fibro shack. Also on the list of favourite things is the coffee, lunch and your evening entertainment that can all be found along the Hastings Street strip. Follow your nose. The apartments are a little more spectacular than most at the Rise Noosa, with plenty of light, views and the flow from indoor living spaces to the balcony is seamless. Home is what you will feel with the modern, oversized furnishings and breezy fittings. The spirit of good design lives here, and with all Miele appliances in the kitchen cooking is rarely a chore while on holiday at the Rise Noosa. If you can’t bear apartment living then you’ve got the choice of staying in our two and three bedroom villas. These two level standalone houses provide guests with a modicum of privacy that is not offered with inter tenancy walls. The master bedroom and second bedrooms open onto beautiful tropical landscaped courtyards. So if you are planning a holiday on the Sunshine Coast, what better Noosa Heads holiday apartments to book than the Rise Noosa. Our luxury accommodation of fully self contained two and three bedroom apartments and townhouses on the ridge of Noosa Hill are waiting for you and your family. Our Noosa Heads apartment accommodation, the Rise Noosa is just minutes away from Noosa Main Beach, and even closer to the famous Hastings Street. Our apartments are ideal for family get togethers, and have the perfect dinner party location. What better place to enjoy the company of friends and loved one than with a view overlooking Laguna Bay. All apartment kitchens feature Miele appliances. This is not your average cold water beach shack of yesteryear. Ours is an award winning resort with all the necessities of modern life wrapped up in Noosa style — casual and relaxed yet modern. When you come to Noosa, you’re here to relax and unwind and here at The Rise Noosa you can leave your car in our undercover carpark and walk to the beach, the Noosa River or Hastings Street. Just around the corner is Noosaville, the Noosa’s riverside precinct. There you can swap your sea views for placid river views and explore even more of Noosa’s spectacular restaurant culture. Then there’s day tripping around the hinterlands to the quaint little villages of Montville and Maleny perhaps, or take a hike through the Noosa National Park. You might meet a koala on the hike through. At the other end you’ll come to Sunshine Beach. It’s a little wilder than Main Beach but it’s fully surf patrolled if you’re keen for a swim and afterwards you can drop in on the Sunshine Beach Surf Club rooms. There you can grab a cold beverage, a snack or a meal. So there you have it. You couldn’t ask for handier Noosa Heads apartment accommodation, The Rise Noosa is just minutes away from Noosa Main Beach, and even closer to the famous Hastings Street. Make sure you book your perfect Noosa apartments for your perfect Noosa holiday. Book now. If you love Noosa Heads then these Noosa Heads apartments are for you. Even if you’ve never been to Noosa, you should consider the prime position of these superb Noosa holiday apartments at The Rise Noosa. Noosa Heads takes in the central part of Noosa, bounded by Laguna Bay, Hastings Street, the Noosa National Park and bordering the northern aspect of Lake Weyba; as distinct from Noosaville on the western side, the Noosa North Shore and Sunshine Beach. Noosa Heads is compact enough to manage with your car parked in our secure undercover parking in the resort building. Hastings Street and Main Beach are just a few minutes walk from The Rise Noosa, and the rest of Noosa can be circumnavigated with the Noosa Ferry, although it may pay to drive to Sunshine Beach if you’re planning an excursion there. If you are a keen hiker, the track through the Noosa National Park also takes you to Sunshine Beach. There you’ll find an excellent surf beach that is well patrolled by the Sunshine Beach Surf Club which you’ll also find is an excellent place to enjoy a cold beverage, lunch or dinner. Across the road, the award winning Asian fusion restaurant Embassy XO is well worth a visit for yum cha lunch or banquet dinner. These are beautifully designed apartments with plenty of space. The clever design never get’s in the way of your holiday, although its certainly it’s not a shy and retiring. It will faintly remind you of the humble origins of the Noosa beach house. This Noosa Heads accommodation use of many different and lightweight materials — the fibro and corrugated iron shacks, driftwood and hardwood finishes. You’ll catch glimpses if you’re looking, but most of all the light, airy and generous living spaces. You’ll love the balconies that flow effortlessly from the living area, which can also be made private or for ambient light control thanks to the versatile wooden louvre screens. They are on rails so reconfiguring your living space is easy. If you like the sound of Noosa Heads, then these Noosa Heads apartments are for you. Noosa’s best accommodation destination. The Rise Noosa. Book now. You’ll find the ideal family holiday accommodation at this Laguna Bay Noosa accommodation. Whether you are looking for a holiday apartment, or standalone accommodation for your trip to Noosa, the Rise Noosa has a place for your holiday accommodation. The apartment’s wide open spaces and expansive views over Laguna Bay are a couple of compelling reasons why our guests love the Rise Noosa. The breezy open plan living and dining areas flow seamlessly onto the balcony. The kitchens have canteen-style windows that can be opened for access to the rear courtyard. Coffee lovers will appreciate the built-in espresso machine that are incorporated in every kitchen, although Hastings Street is populated with plenty of cafes serving great coffee if no one wants to be the barista. The three bedroom villas offer comparable luxury accommodation over two levels with bedrooms and bathrooms on the ground floor and living, dining and kitchen on the first floor. The master bedrooms open onto a private, tropical courtyard and the second and third bedrooms open onto their respective garden courtyards. Noosa’s Main Beach is just minutes away, four hundred metres exactly and one of the Sunshine Coasts’s favourite family beaches. It’s unspoilt waters and gentle surf, make it ideal for kids to swim and splash under the watchful eye of the local surf life saving patrol. Beginner surfers will find enough waves to practice their moves without the danger of landing on jagged rocks. You’ll love the convenience of Noosa’s Hastings Street too, and by holidays end will have a well beaten path trod to it. Coffee, food and evening entertainment — which place will become your favourite? Hop on the Noosa Ferry and cruise over to Noosaville for more things to do and places to eat. Get into some river-based recreational activities; hire a tinny and go fishing, or maybe a BBQ pontoon and get the whole family onboard for a cruise down the Noosa River. Just say yes. Your Noosa family holiday starts with this Laguna Bay Noosa accommodation at the Rise Noosa Holiday Apartments. Make it perfect. Book now. Life truly is a beach at these Noosa holiday apartments. The Rise Noosa may not be beachfront, but these apartments have some staggeringly beautiful views of Laguna Bay, and what’s more they are a mere 400 metres from Noosa’s Main Beach. You don’t have to be an architect to appreciate the casual style of The Rise Noosa. Composed of a medley of materials, this Noosa holiday apartment resort is an ode to the beach houses of earlier days when they might have been little more than fibro or corrugated iron sheds. The Rise Noosa takes these ideas into the twenty first century and delivers a lucid interpretation of the Queensland beach shack. Some recognisable traits are retained — the use of lightweight materials, and also the honest and straightforward use of materials. The steel beams and trusses are exposed as design features for all to see. All this building in the vernacular may be all very well, but what you probably want to know is, are these apartments any good for a Noosa beachside holiday? We won’t hide behind any fancy language, but oddly enough with all the glass that comprises much of the apartment living areas, there are also plenty of wooden louvre screens to draw when glare of the day is overbearing, or when privacy is required. But that’s just the start of the list of features that make The Rise Noosa such an outstanding accommodation destination. The space (lots of it), decor and furnishings (high-end modern), kitchens (designer), coffee (in-house espresso), pool facilities (epic) all add up to an outstanding place to stay. Life truly is a beach at these Noosa holiday apartments. You’ll love the staggeringly beautiful views of Laguna Bay, and the handy distance to Hastings Street and Main Beach. Why wait any longer. Gather your friends and family. The Rise Noosa. It’s too good not to share. Book now. These holiday apartments in Noosa can be found located on Noosa Hill where you get the best views of Laguna Bay, yet are only a five minute stroll to Noosa’s world famous Hastings Street, home of world class restaurants, exclusive shopping and of course, Noosa’s Main Beach. Action on the water is never far away. Hire motor launch or BBQ pontoon for your adventure on the river, or jetski at Laguna Bay. Fast, slow, quiet or frenetic, there’s a pace to suit your sense of adventure and excitement. There is also going to be a beach to suit the abilities of most surfers. Noosa Main Beach is a family friendly beach with calm seas and small swells that is great for newbies, the beach floor is clean and flat and waves usually are no higher than three feet. It’s a safe swimmers beach all year round, and good for fishing. Noosa Heads is a great beach for surfers for beginners and advanced surfers. You can also add First Point Beach to the beginners list too. Experienced surfers and professionals will find the waves at Tea Tree Bay Beach or the Granite Bay Beach satisfying, Johnsons Beach presents a suitable challenge throwing bigger waves and swells and on some of these beaches the ocean floor is very rocky, so the right surf gear is recommended. The Everglades are also a popular destination to explore in Noosa. The Cooloola Recreation Area of the Great Sandy National Park in Queensland consists of a vast waterway and wetlands network which is perfect for kayaking and canoeing, whether it’s either on your own, or in a guided tour group. The Noosa Biosphere Reserve covers over 150,000-hectares, and has everglades heaving with interesting ecosystems. A paddle along the waters of the Biosphere will likely reward you with some extraordinary wildlife sightings such as: inland dolphins, dugongs, sea turtles, mangrove-dwelling butterflies and migratory shorebirds to name but a few. Nature lovers will really appreciate these pristine habitats. These holiday apartments in Noosa may be close to Noosa’s world famous Hastings Street, home of world class restaurants, exclusive shopping and of course, Noosa’s Main Beach. There is so much more to see and do once you check-in to The Rise Noosa. Book now. Your search for holiday apartments in Noosa Heads is over, let The Rise Noosa be your next Noosa holiday accommodation destination. The Rise Noosa is a spectacular holiday resort with 4 star apartments and villas. Built with a medley of materials that are easily recognised as the cornerstone building materials of the ramshackle cold water beach houses of earlier days; corrugated iron and oiled hardwood timber. You’ll be greeted by the distinctive façade of the entrance building that is sympatico with its leafy tropical bushland surroundings. You’ll love the huge spaces of the apartments even more. These cleverly designed holiday residences have been built for maximum light and generous living areas that seamlessly blends the indoor and outdoor spaces. If you love food then you’ll want to follow the Noosa Gourmet Food Trail. It roughly looks like this and it’s by no means authoritative, but it does give you an entree into what is going on in the way of good food in Noosa. This Hastings Street restaurant: one of the best has to be Berardo’s — the French chef Geoffroy Marcq has cooked in two-Michelin-star kitchens and is now cooking with the freshest Noosa produce — it has to be good right? The Rise Noosa is just 400 metres from Main Beach, yet another reason why The Rise Noosa is such a convenient choice along with the 20 metre heated wet-edge swimming pool, hot jacuzzi, and wonderful landscaping. The Rise Noosa makes perfect sense as the holiday apartments in Noosa Heads you book next. Go on, book now. You know you want to. Congratulations, Noosa luxury holiday apartments such as these are a rare find. Located on Noosa Drive, Noosa Heads, The Rise Noosa apartments offer an exquisite position for your next holiday on the Sunshine Coast just minutes away from the beach, on the fringes of Hastings Street. That’s holiday action on tap, or the quiet tranquility on Noosa Hill. Make the most of your holidays at this luxury Noosa accommodation, it has so much more than you’d expect. The superbly designed galley kitchens are equipped for easy entertainment with plenty of bench space and stainless Euro appliances. Mornings are an cinch too with the built-in espresso machines. Indeed the same consideration for design and livability is applied throughout the entire apartment. The living areas are huge and extend out to equally oversized balconies, populated with day beds and sun loungers. Leave your car in our secure undercover parking and walk around Noosa Heads during your holiday as there’s plenty to do locally, whether it’s going to the beach, or checking out the activities on the Noosa River. There’s always plenty to do. Stand up paddle boarding and kayaking have options available for exploring the river or on the beach at Laguna Bay. Surfing is good too, learners can use the Eastern corner of Main Beach while the rest of the family can kick back at this fully surf patrolled family beach. More experienced surfers in search of a fix can usually find a beach nearby. Sunshine Beach is more exposed and the surf breaks are usually a little more challenging. All the same, Sunshine Beach offers a more bracing alternative to the calm of Main Beach. It’s still considered a family beach, patrolled by the Sunshine Beach Surf Club. The club also has a bar and bistro which is open for breakfast, lunch and dinner. Just perfect for an after swim drink or meal, with mean views overlooking Sunshine Beach. For holidaymakers looking for a more upscale dining experience, the Embassy XO always delivers, whether for yum cha or an evening banquet. Noosa luxury holiday apartments such as these are a rare find. Located on Noosa Drive, Noosa Heads, make The Rise Noosa apartments the place where you stay for your next holiday on the Sunshine Coast. Book now. The Rise Noosa is a fantastic base for your holiday on the Sunshine Coast. It’s the apartment accommodation in Noosa Heads where it’s so easy to visit the many and varied attractions which the Sunshine Coast is famous for. The hinterland offer a picturesque landscape to drive through, with the beautiful Glass House Mountains and the promise of interesting and quaint villages to explore. Maleny and Montville are treasure troves for antique and craft shopping enthusiasts. Devonshire teas are also a feature in these townships. Just look out for the tearooms and you’ll find some excellent refreshments. Closer to Noosa is the well-known Eumundi Markets. Also close to the town of Pomona. This little town is best known for the orchards and the produce. The country markets are held every second and fourth Saturday of the month. There’s over fifty stalls selling collectibles, crafts, plants, books, organic fruit and vegetables and clothing. The historic town of Cooroy with it’s busy artisan centre is also well-worth a visit. You won’t be short of refreshments with cafes and restaurants nearby. There’s also a diverse range of shops, from fashion and homewares to gifts, books, antiques and second-hand bargains to browse. The restored Butter Factory Arts Centre in the Cooroy Butter Factory has local and national artists exhibiting. This new arts complex is part of the new Cooroy Mill Place, a tourism hub that includes a modern library, and they’ve retained many of the old plant features; there’s a guided walk that will take you through the restored boilers and kilns every day. With plenty of places to visit and things to do in the Sunshine Coast, The Rise Noosa is the apartment accommodation in Noosa Heads where you’ll want to stay. Book now for a holiday in Noosa that you will remember for a long time. Luxury isn’t just about the spectacular design and comfort of holiday accommodation, but you can tick that off the list with our luxury apartments in Noosa. It’s also about how easy and accessible the rest of your holiday activities are too. At The Rise Noosa you are central to most of Noosa and within easy walking distance of Hastings Street and Main Beach. Very handy if you looking for accommodation that is close to the myriad of water activities in Noosa. Water sports action starts by hiring a motor launch on the Noosa River, or jetski at Laguna Bay. Noosa’s Main Beach hardly needs any introduction; Surf Life Saving Queensland has named Noosa as Queensland’s most popular weekend beach destination. Our superbly appointed two bedroom and three bedroom apartments and penthouses should do the trick for luxury accommodation seekers, but if you prefer even more privacy our freestanding villas are the perfect option for you. All our apartments are fully self contained and kitchens are fully equipped with Miele appliances, laundry facilities, air conditioning and wi-fi. You’ll be pleased to note that the balconies sport some fine outdoor daybeds. An upgrade to our Noosa penthouses offers even more stunning views over Laguna Bay and are the perfect place to chill after a day on the beach or exploring beyond the Noosa area. Our 20 metre heated wet edge swimming pool is the perfect place to unwind, with the hot jacuzzi nearby set in beautiful landscaped surroundings, complete with delightful water features. Talking of beyond, the hinterlands are great sightseeing and exploration excursions, the network of quaint little towns and villages such as Maleney and Monteville offers a peek into another world. Closer to home hike through the Noosa National Park and you’ll end up in Sunshine Beach where you’ll be greeted by a charming set of shops with bakery and corner shop. Across the road is the Sunshine Beach Surf Club. Relax in the bistro with a cold drink, or stop for lunch. If it’s later maybe dinner. From our luxury apartments in Noosa you’ll find out how easy and accessible Noosa’s attractions are. The Rise Noosa. Book now. 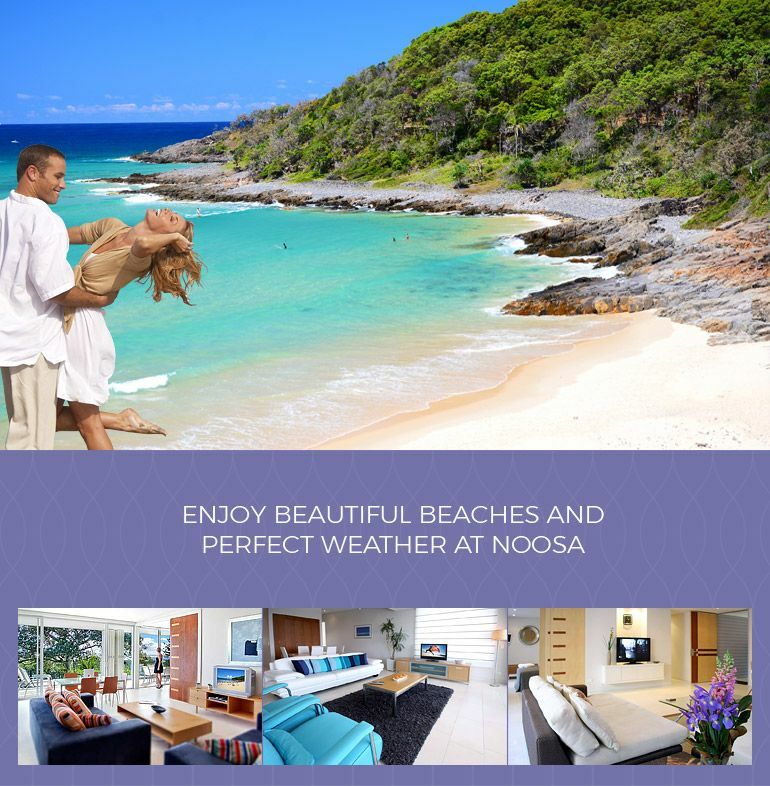 We think you might like this accommodation Noosa. The Rise Noosa is one of Noosa’s premiere holiday resorts where they have managed to turn Australian beach life into something of an art form. This delectable three level holiday apartment resort sits on the “rise” of Noosa Hill. With the superb views overlooking Laguna Bay, this collection of Noosa holiday accommodation is truly worthy of it’s namesake, The Rise Noosa. From the moment you first walk through the door of these luxury apartments, you’ll be greeted by space, not just lots of space, but thoughtfully laid out interiors that intersect with the great Australian outdoors. The result: highly livable, highly enjoyable holiday apartments which have been designed to squeeze every last gram of pleasure out of the respective apartment spaces. You’ll find superb two and three bedroom apartments here, and if you wish to upgrade to the best, the penthouse apartments deliver all the sumptuous luxury of space and views. The galley style kitchens have been carefully considered. Perfect for entertaining. Cook up a storm. The Miele appliances make meal preparation a real pleasure, not a chore. Coffee enthusiasts will also enjoy the built-in espresso machines, and kids will love the tropical fruit smoothies you can whip up with the state of the art blenders. The Rise Noosa is big on details like these. It all sounds too good. But really this is just the start. The living areas have been designed for, well, living. They’re big generous areas with French doors that lead to the gorgeous balconies, and these aren’t just any balconies either. The timber louvres that are attached to the outside can be opened or closed, depending on your mood: to let the light, sun and view in, or relax in privacy on the fabulous day beds. Forget the rest, book this accommodation Noosa and be assured of your luxury holiday accommodation beside the beach. The Rise Noosa. Go on, that holiday won’t book itself you know. It’s time for you to come home to these Noosa luxury apartments. The Rise Noosa is one of Noosa’s premiere holiday resorts with an assortment of apartments, penthouses and townhouses for travellers who prefer luxury accommodation. There is nothing quite like Noosa, it occupies one of the most enviable positions on the Sunshine Coast, and is the jewel in the crown of the Queensland Coast. Here at The Rise Noosa you can experience the romance and charm of beach living with all the comforts of urban life. Families are especially welcome here, we have accommodation that will suit most sized groups with two and three bedroom apartments and penthouse accommodation available in two and three bedroom options. The townhouses too run to two or three bedrooms. You’ll find whichever option you choose will have ample space, space that is airy, light and eminently liveable. With the expansive floor to ceiling windows, Noosa’s Laguna Bay is always present in the background, and behind the resort lies the hinterland, also another inspiring view. The balconies perhaps take the cake for brilliant exposure to sea views, but also for the effortless flow from the indoor living areas to the outside. Grab a seat at the outdoor dining table, or relax on one of the sun loungers. There’s lightweight wooden louvre screens that can be moved into place to cut the glare, or to adjust your privacy if required. Then again, the famous Noosa Main Beach is just 400 metres from The Rise Noosa, that’s walking distance both ways, even after a day slogging in the Queensland sun, or returning after dinner. It couldn’t be handier, or quieter, making The Rise Noosa really the ideal accommodation destination for holidaymakers who want it all. Style, space, location, views. What more could you ask for? Jump in and take and look. We think you might like what you see. It’s time for you to come home to these Noosa luxury apartments. The Rise Noosa is one of Noosa’s premiere holiday apartment resorts with an assortment of apartments, penthouses and townhouses. Get your family together and book now. You’ve come to the pages of the perfect Noosa luxury accommodation. The Rise Noosa has all the options for any sized group. Whether it’s family and friends, or just family we have 2 and 3 bedroom apartments, penthouses and townhouses. Our perfect location is situated on the rise of Noosa Hill just minutes walk from the action on Hastings Street. Not that you’d know it, this tranquil oasis resort is hiding in plain view, surrounded by lush tropical plantings. Select one of the north-facing apartments and you’ll enjoy the most exquisite view of Laguna Bay with views all the way up to the Cooloola Headland. You won’t have to go that far for action and adventure, but if you are a fan of the Great Walks then there’s a 5 day hike waiting for you at the Cooloola National Park. Closer to The Rise Noosa is the Noosa Biosphere Reserve. You can explore this amazing ecosystem on your own adventure, or take one of the many eco tours run by professional guides. Their narratives will show you why the Noosa region has been recognised for its international Biosphere Reserve status by the United Nations Educational, Scientific and Cultural Organisation (UNESCO). You’ll be taken to many locations to experience the diverse ecosystems of mangroves, wetlands, and aquatic and land-based habitats. That’s not all, Noosa is now Australia’s newest World Surfing Reserve, recognised for decades of coastal stewardship, management and protection. Since 2015, Noosa a has been officially recognised as a surfing destination of immense environmental, heritage, sporting and cultural value. It’s five famous point breaks; the Noosa River mouth to the northern end of Sunshine Beach, and the iconic point breaks in and around Noosa National Park make up this surfing reserve. With the perfect Noosa luxury accommodation and the best reasons for visiting and exploring Noosa, The Rise Noosa has to be your best choice to stay and play. Whether it’s family and friends, or just family, we have 2 and 3 bedroom apartments, penthouses and townhouses that will be perfect for you. Book now. You’ll find our accommodation Noosa Heads very much to your liking if you appreciate the difference that clever architecture can make to a Noosa holiday resort. The Rise Noosa is built around something they call Aussie vernacular architecture. A beach shack aesthetic where you can relax in style that recalls the fibro shacks built in another century. But don’t let the lightweight materials deceive you. These are Noosa holiday apartments through and through. Styled perfectly for the holidaymaker who remembers the summer trips to remote coastal boltholes, except they’ve evolved to a level of comfort and luxury previously not seen before. Here you’ll find spacious and airy apartments and townhouses waiting for you. There’s lots of space to spread out, and on the upper levels the views where the Noosa River meets the sea is simply magnificent. Especially the evening vistas that provide fairytale sunset views. You’ll also enjoy the convenient position to Noosa Heads, there the popular Noosa attractions are within easy walking distance. Main Beach is always a crowd favourite, sheltered, calm and patrolled, this beach is perfect for family outings. More secluded coves and beaches can be found along the headlands including Alexandra Bay, or even closer at the Northern tip of Main Beach at First Point. It’s the perfect longboard break and when a medium-sized swell is happening it is perfect for beginners. But be careful, these parts of the Noosa coast are not patrolled. After a day out in Noosa whether it’s just hanging out locally on the beach or on Hastings Street, or travelling further afield on a tour to Fraser Island or ambling through the hinterlands, The Rise Noosa is great to come home to. The chilled spaces and furniture of the apartment, and the pool in the lovely tropical courtyard make for a welcome return. Cooking is a pleasure too if you’re self catering. The narrow galley kitchens are fully equipped and possess all the mod cons including stoneware bench tops and industrial-grade espresso maker. What the kitchens lack in swinging room, is more than made up with an ergonomic kitchen that has everything at your fingertips. So what are you waiting for? Book our accommodation Noosa Heads now, and when it’s time, just throw everything in the car for your summer holiday adventure at The Rise Noosa. It couldn’t be easier. You’ll adore our Noosa penthouses. Really. Sitting atop The Rise Noosa apartment buildings, our three bedroom penthouse suites promise unforgettable Noosa accommodation experiences. The magnificent views over Noosa Heads and Laguna Bay provide the living room and balcony with the perfect extensions of this luxury Noosa accommodation. The balcony does double-duties as the sun loungers and balcony dining areas, buffered between the bedrooms and the view, balcony louvres can be drawn to adjust the afternoon and evening sunshine. They can also be drawn back completely to provide unencumbered views. Meals are a pleasure to prepare in the stylish galley kitchen where the kitchen windows are able to be opened like the portal of a bistro servery. Barbeques and outdoor meals take on a novel twist with courses cooked in the kitchen and then passed through the window. It’s almost impossible to use Hastings Street as an excuse to get your coffee fix, with the kitchen equipped with a cafe-grade espresso machine. Unless of course you want to, then there are innumerable cafes to visit, and many more restaurants to sample. Welcome to the the entertainment epicentre in Noosa. Hastings Street has everything required to make your visit to Noosa a delectable cocktail of memories. Fill your days and nights with adventure and fun. There’s plenty of beach and river activities and the main street has a delightful range of boutiques and designer stores to peruse. For night time action, there is an unlimited supply of top notch bars and restaurants to experience. For late night entertainment, Miss Moneypenny’s is the restaurant, bar and nightclub venue to visit. Fun to the wee hours in the morning is all in store if you would rather not be sleeping. Don’t hesitate, our Noosa penthouses at The Rise Noosa will provide you and yours with the quintessential Noosa accommodation experience. Book now to avoid disappointment. If it’s Noosa accommodation Hasting Street you’re looking for, then you’ve found it. Situated on Noosa Drive just 400 meters from Hastings Street, The Rise Noosa is the perfect location to stay. 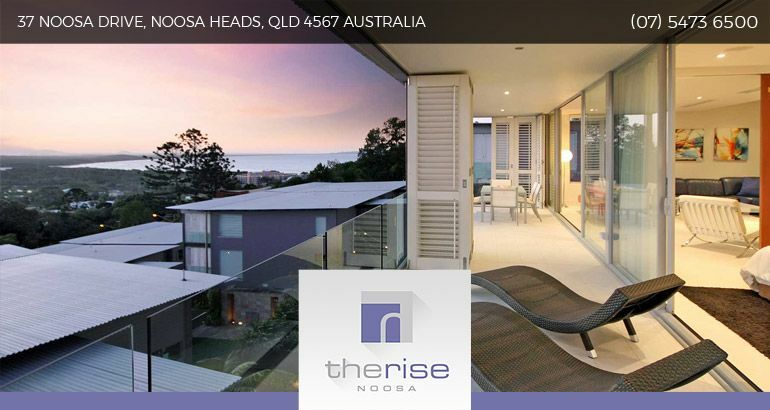 Nestled amongst lush tropical plantings, if the The Rise Noosa looks oddly familiar. The lighter feeling of the buildings and mix of timber, rock and stone is deliberate. The design and use of different materials is a definite nod to the beach shack of another time. If there is a passing feeling of nostalgia then it’s worked, but that feeling quickly passes when you’re inside your apartment or townhouse at The Rise Noosa. The luxurious interiors and furnishings will have you immediately at ease, and the floor to ceiling views provide a visually arresting backdrop to your sunny Queensland holiday. The Rise Noosa is a fantastic holiday base. With a carpark for every apartment it’s easy to take off to the many and varied attractions for which the Sunshine Coast is famous for. The hinterlands offer another kind of landscape to drive through, with the beautiful Glass House Mountains and some interesting and quaint villages to go antique and craft shopping. Devonshire teas are also a feature of the area. Closer to Noosa are the well-known Eumundi Markets. An area that is also worthy of attention is the town of Pomona. This little township best known for it’s orchards and produce. Pomona hosts country markets every second and fourth Saturday of the month, with over fifty stalls selling collectibles, crafts, books, plants, organic fruit and vegetables and clothing. How about the historic town of Cooroy with its busy artisan centre. Enjoy hinterland hospitality at a cafe, restaurant or club, and browse the diverse range of shops, from fashion and homewares to gifts, books, antiques and second-hand bargains. The restored Butter Factory Arts Centre in the Cooroy Butter Factory features local and national artists and is part of the new Cooroy Mill Place, a tourism hub that includes a state-of-the-art library and an guided walk through restored boilers and kilns. As you will have read, there are plenty of places to see and visit in the Sunshine Coast. The Rise Noosa is the Noosa accommodation Hasting Street where you’ll want to stay for restful accommodation that is close to everything else. If you’re looking for an easy getaway then this affordable accommodation Noosa should suit you well. The Rise Noosa Apartments are located a short walk from Hastings Street, Main Beach and the Noosa River. At this Noosa Resort you can choose from a range of two and three bedroom apartments at a very affordable rate. 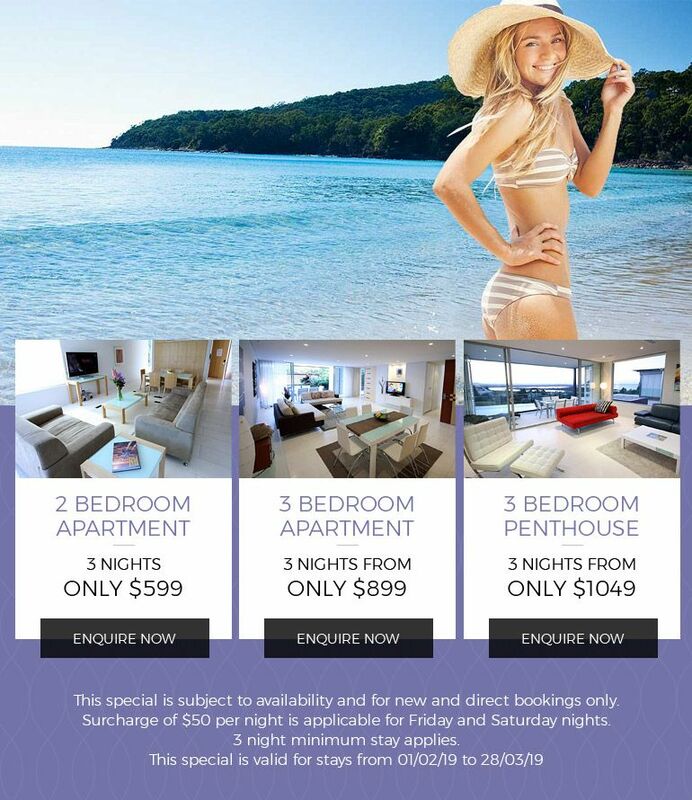 Perfect for couples, families as well as friends wanting to enjoy all that Noosa has to offer. If you’re here for the superb gastro delights of Noosa then Hastings Street offers a wonderful concentration of bars, cafes, clubs and restaurants to keep you fuelled and entertained. Wander Hastings Street to enjoy a feel of the fantastic food that is on offer. The Beach House Peter Kuruvita, Miss Moneypenny’s, Aromas, Roccoco Bistro and Bar, Gelatissimo for your day time treats, Locale and the list goes on and on. Work up an appetite paddleboarding on the Noosa River. If this is your first time you can take a lesson with Noosa Stand Up Paddleboards, before long you will be standing up on your board and paddling confidently down the river with the sun on your back and a gentle breeze in your face. Or take a break on Main Beach, the soft sand is very inviting. When you are done lazing around why not take a walk up the hill to the Noosa National Park. At just 15 minutes’ walk from Noosa Main Beach, you can choose from a variety of walking tracks ranging from 45 minutes to four hours. You’ll come back with a healthy appetite. With this affordable accommodation Noosa, you really will have more change in your pocket for your recreation budget. 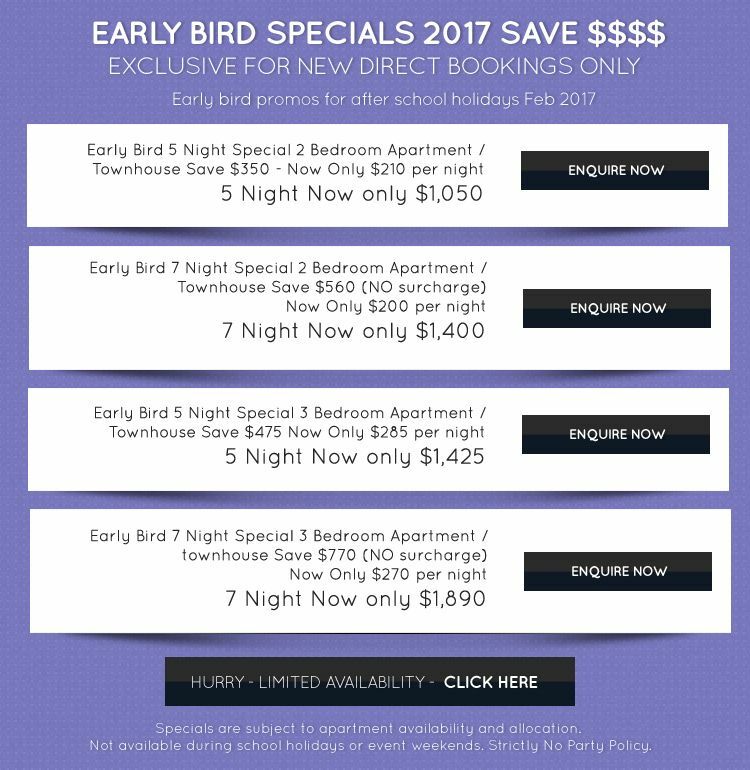 Book now at The Rise Noosa Apartments. The fun lasts longer here. Are you looking for apartment accommodation Noosa? This is it, especially if you are here to enjoy the fantastic food culture in Noosa. Our wonderful apartment accommodation is perfect for couples, families and friends looking for a relaxing Noosa break in reasonably priced central accommodation. The apartments, townhouses and penthouses at The Rise Noosa are fully self contained, making it a breeze to self cater. With luxury furnishings and fittings, these apartments are perfect for all Noosa holiday makers. For many guests who choose the apartment option it’s a matter of selecting the amenities you will use as many travellers arrive in Noosa without a car knowing that in Noosa it’s possible to walk or use public transport for getting around. Especially the Noosa Ferries. They offer the perfect mode of transportation with the route going all the way down to Tewantin and back to Hastings Street. Perhaps the furtherest you may get is to Gympie Terrace to experience Noosaville’s version of restaurant hospitality beside the river. Indeed when it comes to dining, fine dining or otherwise Hastings Street or Gympie Terrace and their sides treets have the very best that Noosa has to offer by way of gastronomic pleasures. A quick search on TripAdvisor will tell you everything you need to know. Noosa isn’t all about eating though, with the Boat Hire Company just around the corner from The Rise, your river recreation might just be all taken care of. Whether you need a stand up paddle board to burn some kilojoules, or a kayak to explore the Noosa Everglades, you can hire it there. There’s even BBQ pontoons and cruisers if you want to make a day of it on the river. There you have it, the best apartment accommodation Noosa that money will buy at The Rise Noosa Apartments. Book now, they are always popular. This family accommodation Noosa is a head turner. Check out our luxury Noosa apartments. The kids will love the heated pool while Mum and Dad relax in the outdoor spa soaking up the relaxing atmosphere at The Rise Noosa. The apartments offer ample room for the family to settle into for the duration of the holiday, they are a generous size, unlike some of the more economically-sized apartments that are available in Noosa Heads. With luxury fittings and furnishings, The Rise is sure to please all family members. At The Rise you are literally at nature’s doorstep. Wander with the family along the Noosa River and watch the boats sail by as the sunsets. Enjoy a family BBQ, or takeaways on the river bank, or hire your own boat or catamaran instead. Main Beach is also nearby. It needs almost no introduction. One of the few beaches along the Australian coastline that faces north, this beach is perfect for families, or anyone wanting a beach that is safe and predictable with gentle waves patrolled by surf lifesavers. With wonderful conditions all year round and Main Beach patrolled 365 days a year, little wonder this is a repeat destination for so many families. The Rise Noosa is a short walk from well known Hastings St. It’s fun for people who don’t like cooking when on holiday. Home to a great range of award winning restaurants, cafes, takeaways as well as Bay Village on Hastings food court. It’s your starter for easy meals. The food court offers lots of healthy and delicious options for meals. Sushi, kebabs, Thai, Subway and a juice bar are a few of the stallholders in this upmarket food fair. Of course there’s a multitude of superb bistros, restaurants and cafes on Hastings Street too, so it’s unlikely you’ll ever run out of dining options. Make your family accommodation Noosa these holidays at The Rise Noosa. Book now, you’ll have the best time here. These holiday apartments Noosa Heads will hit the spot. Our apartments at The Rise Noosa are a great pick for families and groups who have a taste for independent travel and adventure. This Noosa hilltop accommodation is equipped with generous living areas, superb kitchens and all essential laundries. Not to mention the spacious balconies with outdoor furniture especially designed for the reclined, as well as air conditioning, Foxtel and the all-important free wi-fi — vital for uploading your adventures to social media. These days it seems like if you didn’t take a picture, it didn’t happen. At The Rise Noosa you will definitely feel like it is happening — where you are truly on holiday. With the list of in-house utilitarian essentials taken care of, you can get on with the business at hand — having fun, and there is plenty of that on hand in Noosa. You will want to go and explore the beaches. Whatever your interest, there is a beach for everyone along this part of the Sunshine Coast. Main Beach is always a popular spot for families. Shallow, calm and sheltered, this beach is patrolled year round and is perfect for children and novice surfers with some waves large enough to surf although experienced surfers will usually head to Sunshine Beach or Alexandra Bay where the waves are stronger. If you’re not a surfing enthusiast, traversing the Noosa National Park is a good way to spend a morning. Hike across to Sunshine Beach in the shaded Noosa rainforest. It’s a magnificent stroll with some stunning landscape to take in. Noosa Biosphere is also another great day trip. Take a cruise or hire your own watercraft to explore the mangroves, wetlands and river mouth. You’ll be amazed by how many different habitats you’ll pass through on your way around. Once you’ve finished your nature studies, there are plenty of human habitats to explore too. Venture to Hastings Street or Gympie Terrace in search of the perfect place to hang out and drink coffee. When evening comes, Noosa comes alive with the restaurant trade opening doors. Pick your spot. Pick these holiday apartments Noosa Heads. The Rise Noosa. Book now. Are you looking for Noosa Heads luxury accommodation? The Rise Noosa is a resort that is a short walk to Noosa’s Main Beach, the surf breaks at First Point and Tea Tree Bay, the Noosa National Park and cosmopolitan Hastings Street. Couples, families and groups will find that Noosa is a superb holiday destination with a range of activities and destinations to suit everyone. When you’re staying in Noosa Heads luxury accommodation like this you know everything is going to turn out great. On offer are our superbly appointed two and three bedroom luxury apartments and penthouses. If you like freestanding accommodation where you do not have to share walls with neighbours then our townhouses are the perfect option for you. All our apartments are fully self contained with kitchens fully equipped with Miele appliances, laundry facilities, air conditioning, wi-fi and balconies sporting some fine outdoor daybeds. All apartments feature modern furnishings and decor. The hinterland offer fantastic opportunities for sightseeing and exploration of the network of quaint little towns and villages such as Maleny and Montville. Closer to home the Noosa National Park has a lovely walk that takes you to Sunshine Beach. There you’ll find a charming little set of shops with bakery and corner shop for you to refuel. Better yet, across the road is the Sunshine Beach Surf Club. Relax in the bistro with a cold drink while you peruse the menu for lunch, or perhaps an early dinner. So when you think of Noosa Heads luxury accommodation it’s The Rise Noosa that will be at the top of your list, right? Better yet. 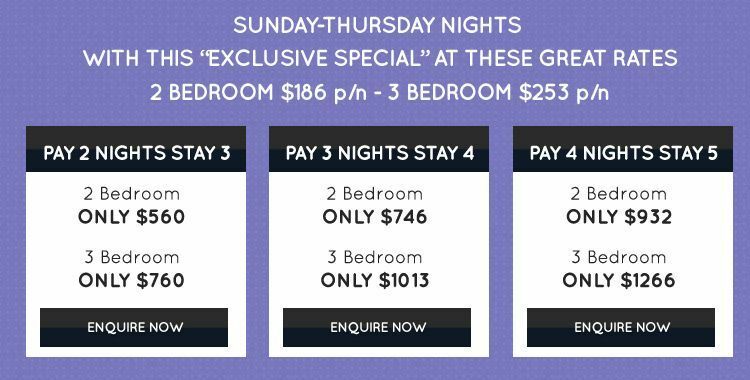 Book now for your next amazing Noosa holiday. Welcome to our spectacular Noosa Heads resort. The Rise Noosa is Noosa’s answer to beach lovers who enjoy their creature comforts. Indeed, Noosa is the beach that has all grown up. Here at The Rise Noosa stands a resort that still evokes the design and spirit of times when holidaying by the beach meant closer encounters with the elements. You too can be one with nature only from the comfort of our luxury apartments. There are no draughty fibro lean to’s, dusty sand-filled floors or compromised bathroom arrangements here. The Rise Noosa Heads accommodation is a clever architectural response to the great Australian beach holiday updated for the twenty first century. Constructed out of corrugated iron, stone and oiled-timber, these apartments blend beautifully with the leafy bushland setting complemented with a lushly landscaped environment of water features and tropical native plantings. Wake up with views of Laguna Bay and native birdsong to gently awaken you from your slumber. A new day begins, and new adventures unfold everyday in Noosa. The possibilities are endless. Whether it’s manmade or back to nature, Noosa has it all in abundance. Savour the Noosa Biosphere. This UNESCO recognised nature reserve occupies over 150,000 hectares of diverse environments. It’s rarely possible to experience so many different habitats in such a compact area. The easiest way to explore the Noosa Biosphere is to book a seat on the Noosa Ferry Eco Cruise. Travel the Noosa River and see for yourself the natural beauty of beaches, mountains, birds and marine life. The binoculars and identification books are issued to everyone for bird and plant spotting. The cruise is also broken with a short guided walk for you to see up close the native flora and fauna. For visitors who enjoy more independent exploration can hire kayaks, standup paddleboards and motor cruisers so they can spend time wandering the various river and wetland habitats. Go on, mix it up, with the high view, plans become clearer at this Noosa Heads resort. Or maybe don’t plan. Just do it. Book now at The Rise Noosa. We’re close to Hastings St accommodation Noosa. In fact we’re so close to Hastings St you can taste it. At a brisk ten minute walk from The Rise Noosa holiday apartments, you can be sitting at cafe or restaurant drinking your favorite beverage in no time. Public transport leaves every fifteen minutes which is very handy. Grab the 620 or 631 bus for an easy transit down, or back up the hill. We really are positioned in one of the choicest parts of Noosa, perfect for your holiday. With gorgeous views overlooking Laguna Bay and the Noosa National Park, you will wake up in paradise with no shortage of inspiration for what to do, places to see and restaurants to dine. With Hastings Street just a stones throw away, it’s easy to pack the eskies and the beach towels and head down to Main Beach, especially if you have a young family in tow. Main Beach is the perfect family beach in Noosa, gentle waves, sandy bottom and gorgeous while sand. It’s just a stones throw from Hastings Street too. So when it all starts to get a little hot, it’s easy to beat a retreat to the gelato bar for an ice cream, one of the cafes for a coffee, or if it’s later in the afternoon, maybe something stronger. Miss Moneypenny’s is the legendary after hours venue, with a full bistro and pizza menu and a bar that never sleeps. As grownup as it might sound, it’s a great place to bring the kids for a pizza, and you a sneaky glass of something cold. Back at The Rise Noosa, you can relax. There’s plenty of space where everyone can have their niche. The day beds on the balcony are fantabulous. Just close the wooden louvres for some added privacy, and adjust for your desired level of light. There’s Foxtel if the kids need to be entertained while their dinner is being made, or bought. We also have free wi-fi for further distraction, or if selfies need to be posted. For Hastings St accommodation Noosa that gives you the full flavored taste of Noosa, few resorts can come close to The Rise Noosa. Make sure you get your well-deserved piece of Noosa. Book now. Aussie, Aussie, Aussie! How do you celebrate Australia Day? Join fellow Noosa lovers as they enjoy the beach, surf, sand, barbecue and beach cricket this Australia Day or head to Aussie World (40 minute drive from Noosa). Aussie World, the Sunshine Coast’s ‘theme’ park will host a range of great range of Australia Day activities. From mullet throwing, the famous dunny racing, tug of war, kids activities and entertainment. Purchase discounted rids passes (only $20) and tickets to the Aussie Day Concert ($10) and enjoy 4 hours of live from at The Shed. Return to Noosa for a relaxed evening at the beach or enjoy a bbq by the pool at your Noosa accommodation. Noosa…the ultimate location to enjoy this years Australia Day. The Rise Noosa, located a short walk from the beach, river, the Noosa National Park and Hastings St is the ideal location to enjoy this years Australia Day. Why not stay for a few extra days and enjoy more of what Noosa has to offer. Book your Noosa accommodation at The Rise and choose from a range of apartments and luxury penthouses for your getaway. All are fully self contained, spacious and feature modern decor and furnishings. Enjoy the onsite resort facilities which include a 20 metre heated wet edge swimming pool and hot jacuzzi, cascading streams and waterfalls, free wifi (limits apply), secure car parking and an onsite tour desk. This Australia Day why not head to Noosa on the Sunshine Coast, enjoy luxury Noosa accommodation, spend some time at Aussie World and Noosa’s stunning main beach. Save the date with January the 20th to the 22nd being the dates of the 2017 Ginger Flower and Food Festival. This annual Sunshine Coast event is held at the Ginger Factory at Yandina and is a 3 day event of food, flowers and entertainment for all the family. Garden lovers will appreciate the florish or colour with the event showcasing the largest and most exquisite range of ornamental gingers and heliconias and offering more than 3000 plants for sale. Foodies will love the cooking demonstrations from renowned local chefs including Matt Golinski, Kelly Lord, Josh Smallwood and Chris White. The children will love the live entertainment and native animal display. Don’t miss this family friendly event that offers something for every family member, head to the Sunshine Coast and be a part of this great local event. Book your accommodation in Noosa today and enjoy more of the Sunshine Coast. The Rise Noosa is ideally located a short 20 minute drive from Yandina and the Ginger Factory as well as Noosa’s main beach and Hastings Street. Offering a fantastic range of fully self contained apartments and penthouses, there is an apartment perfect for your requirements. All feature a well equipped kitchen, spacious interiors and modern decor. Enjoy the onsite facilities including resort style pool, free wi-fi and undercover parking whilst being a short walk to the patrolled beach at Noosa and well known Hastings St.
Book your accommodation in Noosa at The Rise and get ready to enjoy both Noosa and the 2017 Ginger Flower and Food Festival this January. You couldn’t ask for handier accommodation at our Noosa resorts. Our apartments and townhouses at The Rise Noosa provide guests with the most wonderful amenity and accommodation in Noosa. Our stylish Noosa resort is just minutes away from Noosa Main Beach, and even closer to the famous Hastings Street. Our Noosa resort holiday apartments make the perfect family get together, or dinner party location. What better place to enjoy the company of friends and loved than from a balcony overlooking Laguna Bay. All the kitchens of our apartments feature Miele appliances. This is not the beach shack of yesteryear. While we draw our inspiration for the facade of our apartments from the lightweight and breezy materials of the twentieth century, the spaces we’ve built and the functionality that accompanies these interiors are examples of holidays in motion — and if the main purpose of our apartments is holidays and relaxation, and that coincides with your mission, then we have a match! You and your family (or fellow guests) will be drawn to the turquoise waters of our 20 metre heated wet-edge swimming pool. It’s great for laps, or for a bit of fun. Lounging is taken seriously around here too. Our designer outdoor furniture provides a place to sit or recline. Rest assured, our carparking is very secure. Most guests choose to walk while on holiday, with Hastings Street so close. On the rare occasion you are daytripping around the hinterlands, seeking a little variety with your Sunshine Coast beach experiences, or returning from shopping, we have convenient lift access to most apartments. If you’re looking a little further afield while in Noosa, Noosaville should present you with new vistas while dining out. It’s the new restaurant precinct on the Noosa River. Swap your sea views for placid river views and get set to explore new world-beating culinary horizons. So there you go. You couldn’t ask for handier accommodation at our Noosa resorts. Make sure you book your perfect Noosa apartments for your perfect Noosa holiday. The Rise Noosa apartment accommodation should be at the top of every holiday wish list. There’s dozens of reasons why, from the accessible location from Noosa Main Beach and Hastings Street to the clever and witty architecture. You’ll be greeted by the apartment facades of The Rise Noosa that have been assembled from the traditional elements of the beach shack — demolition timber and corrugated iron. Inside, the apartments are anything but the lightweight and flimsy makeshift dwellings of last century. No longer do you have to endure the discomfort of rudimentary living. Yes, living by the beach is it’s own reward. Make your own happy holiday memories in Noosa, at The Rise Noosa. The spacious and effortless flow from the living room to the balcony are another testament of the dexterity and fluency of the architects, and the near flawless design of The Rise Noosa apartments. Not to mention the premium Miele appliances in the chefs kitchens. Cooking should be an enjoyable experience in these high spec kitchens. Furnishings and decor also have pride of place in these elegantly designed spaces. They are a triumph of style and comfort. Well proportioned and modern furniture designed for relaxation. There is little else required to make these the dream spaces for your holiday. Take inspiration from the magnificent views of Laguna Bay from the balconies of most of the apartments. You’ll see jet skiers, stand up paddle boarders and surfers. Perhaps it will be you later. Guests who prefer a more laid back beach experience will enjoy the gentler waves on Noosa Main Beach. Lay down your beach towel and set up your beach picnic here. Ah yes, and the other 39 reasons are the 39 apartments and townhouses at The Rise Noosa. Each one a great excuse to come and stay in Noosa for the idyllic beachside holiday. Why waste your time making lists, make your booking at the The Rise Noosa apartment accommodation now. You and your family deserve the perfect Noosa holiday. The 2016 Noosa triathlon is just around the corner and now is the perfect time to book your Noosa accommodation. 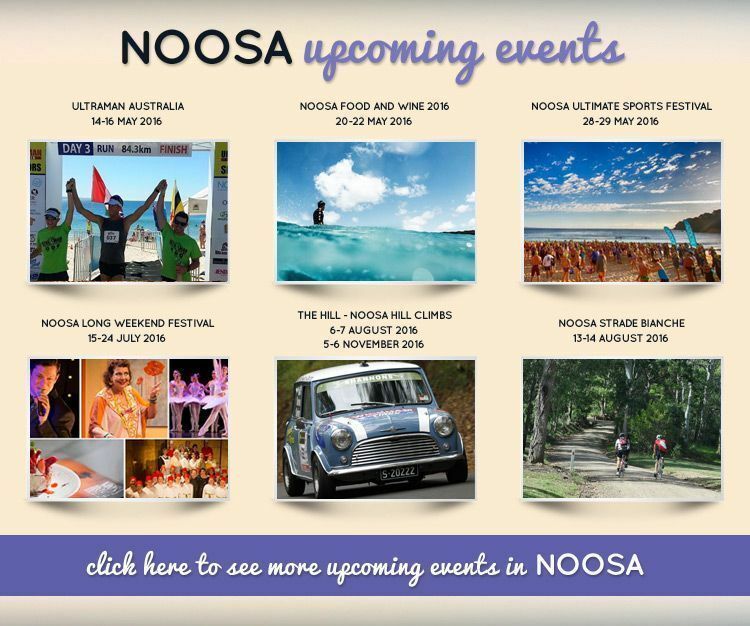 This 5 day event held in the Noosa region will take place from the 26th to the 30th of October. With a great range of sporting events on offer, this event has wide spread appeal. Catering for all ability levels and ages, this years events include the Noosa 1000 Ocean Swim, 5km Bolt, Main Beach Tour de Noosa, Run, Swim, Run, Breakfast Fun Run, Superkidz Triathlon and Noosa Special Triathlon, the Legends Tri and the pinnacle event, the 2016 Noosa Tri. The festival village will host a wide range of family fun activities with live music and food stalls. For more information or to register for this event, check out the Noosa Tri website today. 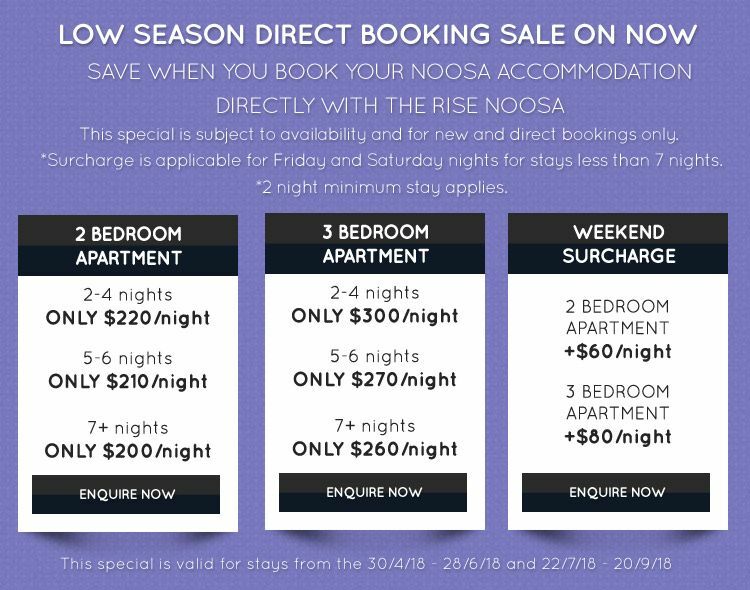 The Rise Noosa offers a fantastic range of resort accommodation perfect for your Noosa stay….why not book for a few extra nights and relax before or after this year event. Ideally located a short walk from the Noosa Heads lions park (transition headquarters) and a short walk to Main Beach, Hastings St and the festival village at Noosa Woods, this is centrally located accommodation. Choose from a great range of luxury 2 and 3 bedroom Noosa apartments, townhouses and penthouse accommodation options. All apartments are fully self contained with spacious interiors and luxury fittings. With a great range of onsite resort facilities, this is the ideal Noosa resort for your stay during this years Noosa triathlon. Hurry, accommodation will fill fast, ring us today to book your Noosa accommodation for the 2016 Noosa Triathlon at The Rise Noosa resort. This is Noosa luxury accommodation you don’t see everyday. The Rise Noosa offers the discerning holidaymaker superbly designed spaces to relax and entertain with sophistication. Their fully self contained 2 & 3 bedroom apartments comprise of capacious and roomy open plan living areas with excellent indoor/outdoor flow. Most apartments will have a gorgeous view of Laguna Bay, and you’ll find all Miele appliances in the kitchens. So far by all accounts, this could be any Noosa apartment resort, but if you have an eye, and a sense of humour you will recognise that this holiday accommodation has been designed with something of the twenty first century in mind while evoking memories of the fibro shack that might have been the holiday abode of choice for mid twentieth century holidaymakers. The Rise Noosa provides their guests with somewhat more robustly built accommodation with significantly more amenity. Space, flow, light, views (nice furniture) and a sense of de ja vu without of the discomfort of rudimentary living. Our 2 & 3 bedroom townhouses probably epitomise this spirit the best. They are a little more compact, but free you from intertenancy walls. Their bedrooms are found on the ground floor and open out onto lovely tropical courtyards. The same impeccable style and attention to detail prevails on a more intimate scale. At a less than ten minute walk to the epicentre of Noosa Heads, Hastings Street is the urban traveller’s perfect beach holiday destination. Some of the finest cafes, restaurants and boutique shopping are to be found on Hastings Street, and Main Beach, the best family beach on the Sunshine Coast is here too. With lots of silky white sand, a gentle surf and proximity to Hastings Street means this beach is something of a crowd favourite. You’ll also enjoy our gorgeous 20 metre heated wet-edge swimming pool, with the poolside furniture, relaxing with a cold drink and a book is a breeze. 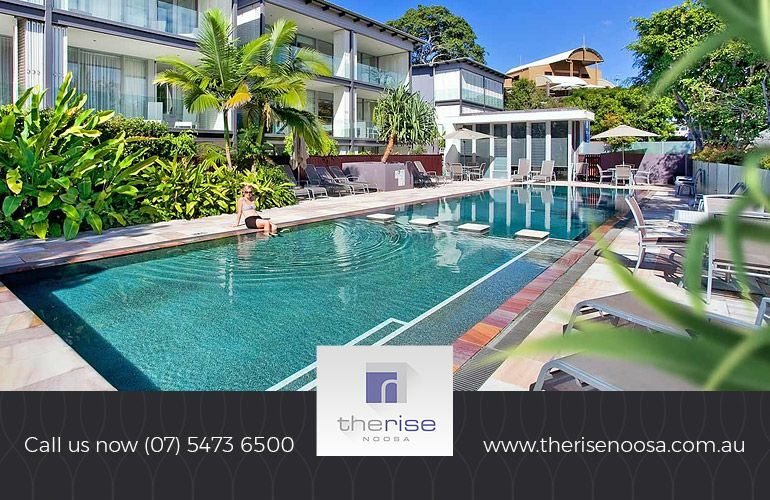 If you are planning a holiday on the Sunshine Coast, you won’t find better accommodation in Noosa than The Rise Noosa. Our luxury accommodation encompasses fully self contained 2 & 3 bedroom apartments and townhouses situated on the ridge of Noosa Drive. It’s also a handy ten minute walk from Hastings Street, the entertainment and hospitality epicentre of Noosa. Coffee, lunch and your evening entertainment can all be found along the Hastings Street strip. You’ll love staying at The Rise Noosa, not just for the superb views overlooking Laguna Bay, but also for the wonderful beach shack aesthetic. The apartment facades incorporate the use of corrugated iron, oil stained timber and stone; a reminder of simpler times, we’ve rolled well into the twenty first century still maintaining the spirit of carefree holidays, without the need to bring the sand back to our abodes. You’ll find stylish and capacious open plan living spaces at The Rise Noosa, with plenty of light, views and outdoor living spaces that segue seamlessly from the indoor living areas. You’ll feel right at home with the modern, over sized furnishings and stylish fittings at this Noosa accommodation. This is where the spirit of good design lives. All our holiday accommodation includes exclusive Miele appliances in the kitchen; because cooking should never be a chore while on holiday. You also have the choice of staying in our 2 & 3 bedroom townhouses. These standalone two level dwellings provide guests with the freedom from intertenancy walls and provide a more intimate although no less stylish type of holiday accommodation. Both the master bedroom and second bedrooms open onto private tropically landscaped courtyards. Wake up gently with the Noosa birdsong. So if you are planning a holiday on the Sunshine Coast, what better accommodation in Noosa than The Rise Noosa. Our luxury accommodation of fully self contained 2 & 3 bedroom apartments and townhouses on the ridge of Noosa Hill is waiting for you and your family. Book now. You’ll find the ideal family holiday accommodation with these Noosa three bedroom apartments. Choose Noosa apartment or townhouse style accommodation for your trip to the Sunshine Coast. Each has it’s own charms. The apartments offer wide open spaces with expansive views over Noosa’s Laguna Bay. The gorgeous open plan living and dining areas flow seamlessly onto the balcony. The kitchen have delightful canteen style windows that can be raised for access to the rear courtyard. Coffee drinkers will also appreciate the built in espresso machine which makes barrista style coffee available at any any time. The three bedroom townhouses offer similar sized accommodation over two levels. The bedrooms and bathrooms are situated on the ground floor with living, dining and kitchen areas on the floor above. The master bedroom opens onto its own private, tropical courtyard with the second and third bedrooms opening onto a second leafy courtyard. The townhouses share the same impeccable furnishings, decor and fittings as the apartments. There are some views of the beach, but the carefully landscaped courtyards predominate, creating an altogether more intimate atmosphere in which to relax. Regardless of which style of accommodation you choose on your Noosa beach holiday, you’re bound to enjoy the thoughtfully designed accommodation. What happens next is definitely down to how you like to pursue your holiday recreation. The Noosa Main Beach is just minutes away. Four hundred metres to be exact, which makes it easy for younger kids to lead the way to the holiday of their dreams: the beach. Parents will love it too. Main Beach is one of the Sunshine Coasts’s favourite family beaches. It’s unspoilt waters and gentle surf, make it ideal for kid to swim and splash. Beginner surfers will find enough wave motion to practice their moves without the danger of landing on jagged rocky bottoms. Hastings Street is also along the same path, and by holidays end will have a well beaten path trod to it. Coffee, food and evening entertainment can all be found there. But hop on the Noosa Ferry and your vistas open up again. Noosaville is another entertainment precinct worthy of attention. There, river-based recreational activities and restaurants on the banks of the Noosa River offer yet further layers of richness to the Noosa beach holiday experience. But remember, your Noosa family holiday starts with your holiday accommodation with these Noosa three bedroom apartments. Make it perfect. Book now. Celebrate film culture and the Noosa Biosphere at the Noosa International Film Festival. Make sure you block out 6-9 November 2016 for this inaugural event. Book your Noosa International Film Festival accommodation at The Rise Noosa for some of the most conscious and discerning holiday accommodation in Noosa. Marvel at the casual beach resort aesthetic, and relax in the deliciously airy spaces. Come back and continue the sparkling conversation of the evening, The Rise Noosa is the perfect late night salon venue. The venues for the Noosa International Film Festival will be spread across the shire, with two of the main theatres in the heart of Noosa. The J Theatre Noosa and BCC Cinemas Noosa will be the anchor venues for the festival. At outlying Pomona is the Majestic Theatre, an example of one of the few early twentieth century theatres still left standing in Queensland, and still screening films. The Eumundi School of Arts Hall will also be used for screenings. Take the time to extend your visit to Noosa and experience firsthand the wondrous Noosa Biosphere. Hire a boat or kayak and explore the byways of the Noosa River. Nearby in Noosa Heads you’ll also want to try out some of the world class restaurants and bars. What better way to debrief and download the key themes of the Noosa International Film Festival in the nicest possible way. Make sure you book your Noosa International Film Festival accommodation at The Rise Noosa for some of the most conscious and discerning holiday accommodation in Noosa. This special is subject to allocation and availability. New direct bookings only. Looking for Noosa accommodation 5 star, consider The Rise Noosa. Offering luxury accommodation with 5 star service, this Noosa resort is the perfect choice for singles, couples, families and groups wanting refined accommodation on their next beach holiday. The Rise offers guests a fantastic range of 1, 2 and 3 bedroom fully self contained apartments, townhouses and penthouses. All feature high end Miele kitchen appliances, stone floors, glass sliding doors and opulent bathrooms adorned with Aroma Senses bathroom products. The open plan living zones extend onto large balconies with timber shutters giving you the choice to take in the view or enclose to form a private outdoor living areas. Our Noosa penthouse apartments enjoy an elevated lookout taking advantage of stunning ocean and or river vistas. The great range of onsite facilities compliment the accommodation with a stunning 20 metre heated wet edge swimming pool, cascading streams and watefalls, hot jacuzzi and onsite tour desk for your day trip bookings. This is luxury Noosa accommodation at its best. Ideally located a short walk to Noosa’s main beach and Hastings St with its cosmopolitan feel, shopping and dining options. It is a pleasant walk to the Noosa National Park, Noosa River as well as Noosa Fair and Noosa Junction. Shopping, dining, entertainment and fun are just a short stroll away. Our friendly staff at the onsite tour desk are more than happy to assist you in booking your day tours whilst in Noosa. Head up into the hinterland, visit nearby beaches, take a day trip to Fraser Island or make a beachside dinner reservation we would love to help you. Everything you could wish for on your Noosa holiday is at your fingertips when you stay at The Rise Noosa. Ring us today to make your booking at the Rise Noosa where you will enjoy luxury Noosa accommodation 5 star service. Noosa annually hosts the third largest Olympic distance triathlon in the world, the Noosa Triathlon Multi Sport Festival which has become Australia’s highest profile triathlon event. Held in Noosa during the last weekend in October, the triathlon is the culminating event the the five day Noosa Multi Sports festival with run, swim and ride events. Attracting a large number of high profile athletes as well as supporters, this stunning beach side holiday village swells offering something for everyone. Athletes get a taste for this stunning location with events that include a swim off beautiful Noosa Main Beach, a ride through the Noosa hinterland and then a picturesque ride showing off all that Noosa has to offer. More than a sporting event there is a range of social events that are a celebration of sports, fitness, fun and a healthy lifestyle. Now is the time to register for this fantastic Noosa sporting festival and enjoy a break in this stunning holiday destination. The Rise Noosa is the perfect Noosa accommodation choice for those heading to this years triathlon. Ideally located a short walk from all the action, Noosa main beach, the Lions Park and Hastings St are all a short walk away. Choose from a fantastic range of fully self contained apartment, townhouse and penthouse accommodation. All are luxuriously furnished and offer comfort and opulence. Enjoy a great range of onsite facilities which include a 20 metre heated wet-edge swimming pool, cascading streams and waterfalls, free broadband, an onsite tour desk and secure car parking. With Noosa to host this fabulous sporting event later in 2016, now is the time to book your Noosa triathlon accommodation at The Rise Noosa. Ring us today, we’d love to see you for this years fantastic Noosa Triathlon. Our Noosa Heads accommodation has an excellent position overlooking Noosa. Located on Noosa Drive, The Rise Noosa offers panoramic views of Noosa Heads out to Laguna Bay. You’ll love the architecture. Something they call Aussie vernacular architecture. At The Rise Noosa architects have perfected beach shack chic. Here you can relax in style. The clean lines of the interiors are complimented with textures of stone on the floors, and the flat exteriors hint at the fibro shacks of another century. But this is now, and there’s lots of glass and wood. More than enough glass to ensure unencumbered sunlight, and views if you have the benefit of elevation in the penthouse apartments. The courtyard views are lovely too with extensive tropical plantings, everyone can share in the lush serenity. It’s an especially appealing scene with the 20 meter heated wet edge swing pool too. Surrounded by sun loungers and shaded from the tropical palms, the pool is an idyllic spot to relax and swim, or recline and enjoy a good book. The Rise Noosa is a short 400 meter walk to Noosa Main Beach. There you will find one of the most popular beaches on the Sunshine Coast, and for very good reason too. It’s flat, calm and very sheltered. An excellent family beach which is fully patrolled. Another spot where you might accomplish some reading. For an invigorating walk, about an hours hike through the Noosa National Park will take you to Sunshine Beach, a beach of a different flavour altogether. More exposed, it’s ideal for surfers, but still patrolled nonetheless. You’ll also find Sunshine Beach is a great hospitality destination with a few cafes and the Sunshine Beach Surf Club where you can grab some excellent meals and enjoy a long cold drink on the deck of the restaurant enjoying the endless sea views. Whatever way you like your accommodation Noosa, you’ll love the relaxed beach vibe of The Rise Noosa resort. The lush tropical plantings in the courtyard and the patios of the ground floor apartments and townhouses provide a very convincing zone of chill. The sunloungers in the courtyard or on the balconies are the ideal spots to enjoy a book or catch some sun. Here at The Rise Noosa we have a comprehensive range of accommodation: apartments, penthouses and standalone townhouses. The penthouses with their floor-to-ceiling glass balcony windows and balustrades show off some of the best views in Noosa. There is also two bedroom townhouses that are well-suited to couples and families who enjoy the privacy of standalone accommodation. The Rise Noosa really is the perfect location for a holiday in Noosa. Perched on Noosa Hill with superb views overlooking Noosa Heads and Laguna Bay, and just a casual ten minute walk to Hastings Street and Main Beach. Just long enough walk to shake off last night and get you ready for the day. Unless of course you enjoy coffee in the kitchens of the apartments at The Rise Noosa. There you’ll find professional espesso machines ready for you to produce your coffee exactly to your taste. Here at our Noosa accommodation you’ll also find it the perfect base to launch your adventures further afield. Places like Fraser Island await. If you come and see us at the Tour Desk we can book the right Fraser Island Tour for you. It won’t cost any more than what you would pay direct, so why wouldn’t you. Australia Zoo is also on our schedule of tours too. We can arrange a coach to pick you up at the beginning of the day to see the zoo that the might Steve Irwin helped to build. Of course you’ll also be returned by coach at the end of the day. You’ll love coming back to our accommodation Noosa. You’ll feel the welcome and love the vibe, here at The Rise Noosa. Book now. We’d love to see you. Our two and three bedroom luxury apartments at The Rise Noosa offer superb Noosa family accommodation. Sitting on Noosa hill with views that stretch over Noosa Heads and Laguna Bay, The Rise Noosa is far away enough from the excitement and buzz of Hastings Street to its peaceful position, yet close enough to stroll to most of the popular Noosa fixtures. Main Beach is just ten minutes away if that, with many of Hastings Streets notable cafes and restaurants even closer. The Noosa playground never looked so good. At Main Beach parents can afford to relax a little, the beach is a sheltered sandy bottomed bay that is well patrolled. Laguna Bay is also very popular for water sports enthusiasts, with jetskis, paragliding, and standup paddleboards available to hire. Enjoy the spacious and airy Noosa accommodation at our apartments. We have something to suit every holidaymaker. Whether you are looking for the quintessential Noosa experience residing atop Noosa in our penthouse apartments or whether you prefer the standalone townhouses for accommodation that offers the privacy of no intertenancy walls and delightfully sheltered tropical garden patios. The pool is also a great place to relax. Set in the central courtyard, you can lie back and enjoy the sun on a lounger or splash about with the kids. The slick and minimalist galley kitchen is another delight, everything well hidden, but also well within reach — the well designed kitchen is a small holiday in itself. With the stoneware benchtops in the kitchen, glass induction stoves and built-in espresso machine, the mornings are going to be just fine. Not to mention lunch and dinner. So what are you waiting for? Here is the perfect Noosa family accommodation waiting here just for you and your family, here at The Rise Noosa. Book now. This is Noosa resort accommodation to remember. Modelled in the style of something they call Aussie vernacular architecture, The Rise Noosa accommodation recalls the rough and ready beach shack aesthetic of yesteryear, except they’ve been updated and reincarnated as the classic Queensland resort beach resort accommodation. You’ll find apartments, penthouses and standalone townhouses at The Rise Noosa. The penthouses have floor-to-ceiling glass balcony windows and balustrades that show off some of the best views in Noosa. The two bedroom townhouses are well suited to couples and families who enjoy the privacy of standalone accommodation. Whatever way you like your accommodation, we know you’ll get into the relaxed beach vibe of The Rise Noosa resort. With the lush tropical plantings in the courtyard and the patios of the ground floor apartments and townhouses, it’s easy to reach that zone of chill. The sunloungers in the courtyard or on your balconies are the perfect spot to enjoy a book or catch some sun. Further afield, the various Noosa attractions are close at hand, especially Hastings Street which is a mere 400 metres away. From there the Noosa River Ferry makes getting around Noosa a delightful and charming way to travel and see Noosa. While you are travelling on the ferry, don’t forget to check out the Noosa Biosphere. You’ll get a chance to view some of the pristine habitats in and around the Noosa River. For nature and wildlife lovers, a dedicated Noosa Biosphere tour, also run by the Noosa Ferry Company will allow you to see firsthand the natural beauty that earned Noosa the title of Queensland’s first UNESCO biosphere. Spectacular views of beaches, mountains, birds and marine life in the various habitats are some of the things you view through the binoculars that are provided. With views aplenty at this Noosa resort accommodation, why don’t you put The Rise Noosa at the top of your holiday list. Book now. Stay in style at The Rise Noosa apartment accommodation for the 2016 Noosa Food and Wine Festival. Located on Noosa Hill, The Rise Noosa offers a superb location from which to enjoy all the delights that this extraordinary culinary event has to offer. Guests get superb views overlooking Laguna Beach, and The Rise Noosa is within easy walking distance of many of the festival venues. The Rise Noosa offers fully self contained two and three bedroom apartments and penthouses, and freestanding townhouses too — if you prefer to stay at accommodation without any intertenancy walls, floors or ceilings. Our luxury apartment accommodation is spacious and well appointed with over-sized couches and outdoor furniture to enjoy the generously sized balconies extending from each apartment. Get set for a smorgasbord of events, as the 2016 Noosa Food and Wine Festival is not you usual food and beverage event. Expect edification and great dining with tours to the Hinterlands exploring Slow Food, sessions with Pete Evans on Paleo eating, wine tasting masterclasses, and cooking demos from visiting chefs engaging with the local produce. Pete Evans teams up with Peter Kuruvita at the Noosa Beach house on Saturday. Having once worked with each other in Bondi two decades ago, Pete and Peter will be hosting an evening filled with nostalgia, humour, and foods both sweet and savoury, drinks light and bold – for a culinary night to remember. Or join celebrity Chef Luke Mangan for an evening with one of his good friends, Chef and Owner of Thomas Corner Eatery David Rayner. It seems that nostalgia and sustainability is an emerging theme for the festival. Setting the pondering aside, enjoy a 4-course dinner and matched wines at a venue on the Noosa River with a menu designed to highlight the beautiful location and super fresh produce. For the Queensland culinary event of the year don’t miss the 2016 Noosa Food and Wine Festival, and make sure you secure the best apartment accommodation for the 2016 Noosa Food and Wine Festival with The Rise Noosa. Book now and count the sleeps. Conditions apply and this special is subject to apartment allocation and availability. With a stunning design from award-winning architects, this Noosa Heads holiday accommodation stands out from the crowd whilst blending in beautifully with its natural surroundings. This resort takes holiday living to a whole new level, prepare yourself for a relaxing Noosa holiday in your luxurious accommodation. Ideally located a short walk from Hastings St with its dining and shopping options, the Noosa National Park and patrolled Main Beach. There are three different holiday apartments to choose from that will be perfect for your requirements; apartments, penthouses or two-story villas. All of these are two or three bedroom configurations, are fully self-contained so you can enjoy a wonderful family holiday without spending a fortune. Step inside your new home away from home and be blown away by the stylishly furnished rooms, the generous spaces and private balcony, this apartment will quickly become your new favourite place. If you ever manage to leave your apartment, then you will find great on site facilities, including a 20 metre wet-edge heated swimming pool set in the landscaped tropical gardens. You will feel tranquil and relaxed from the minute you set foot onto this resort. To escape from the summer heat all apartments have reverse cycle air conditioning and when the doors are open you will enjoy a lovely sea breeze straight off the ocean. This Noosa Heads holiday accommodation is in a great location, just minutes from the beach and Hastings Street where you will have everything you need right at your fingertips. Book the Rise today, Noosa’s best resort and enjoy a calming family holiday in this lovely part of Queensland’s famous coastline. Feel spoiled as soon as you set foot in these holiday apartments Noosa Heads, they are spacious, luxurious and the whole family will instantly fall in love with them. Designed by an award winning architecture team this luxury accommodation Noosa is beautiful and compliments the natural surroundings perfectly, with the resort featuring cascading waterfalls and streams, it is a tranquil haven. It is a short walk from these Noosa Heads holiday apartments to Laguna Bay and Hastings St. Choose a two or three bedroom apartment at this Noosa Heads resort and be blown away by the open-plan living, with a fully equipped kitchen, laundry facilities, air conditioning, free wireless Internet access and private balconies you will be pleasantly surprised. This resort is just 400 metres from Noosa main beach, which puts you in the perfect location, you are close enough to be there in minutes, but far enough away to avoid the hustle and bustle of Hastings Street, this is a secluded and relaxing hotel. However, while staying at this resort we are sure that you will spend some time on Hastings Street being tempted into the restaurants, cafes and boutique shops that lie right on the beachfront. With a 20 metre wet edge heated swimming pool, hot Jacuzzi and beautifully landscaped tropical garden, this resort will become your holiday paradise and it will be a hard goodbye when it comes to leave. Many of our guests enjoy their holiday so much at these holiday apartments Noosa Heads become their holiday accommodation of choice when holiday time rolls around again. The Rise offers a great range of Noosa luxury holiday apartments. This best accommodation in Noosa is a totally unique holiday destination and will have you coming back year after year to experience that perfect family holiday again. Noosa is unique due to it’s sophisticated yet still retains that laid-back beachside town atmosphere. Even with the years of developing and growing, adding award winning restaurants and five star resorts Noosa still remains a beautiful and unrivalled beach town on the Sunshine Coast that provides everyone with an incredible break. With its stunning beaches, temperate climate and natural beauty, it has wise spread holiday appeal. These luxury apartments Noosa are situated a short walk to Laguna Bay and Hastings St and its architecturally designed beauty stands out from the rest of the resorts straight away, you will be delighted that you chose this hotel. With a range of luxury apartments, penthouses and villas you are sure to find the perfect home for your family at this accommodation in Noosa. All are fully self contained with a well equipped kitchen, modern decor and luxury finishes. Many aspects make Noosa unique, a stroll along the beach as the sun rises, a dining experience on the river, a hike in the national park spotting whales, turtles and dolphins, or just sitting peacefully on your private balcony with a good book. The apartments in this resort are two and three bedrooms with fully equipped kitchens, laundry facilities, air conditioning, free internet, cable television and stunning views that are made even better by the floor to ceiling glass windows and balconies. Your holiday at this Noosa resort will allow you time to reconnect as a family and spend some quality time together in the sun. Stay at these Noosa luxury holiday apartments for an unforgettable vacation. Right at your fingertips on your Noosa holiday you will find a plethora of fantastic activities. There are brilliant walking tracks along the coast line and through the Noosa National Park, Noosa Woods or along Noosa’s Main Beach, you will never be short of a beautiful walk. Keep your eyes open for native wildlife if you can take your eyes off the stunning scenery with these walks offering spectacular views over the ocean, Laguna Bay and back towards Noosa. Noosa’s Main Beach is ideal spot to relax, read a book, learn to surf or catch a wave. After a morning on the beach, enjoy a coffee, cool drink or meal in one of the alfresco cafes, trendy bars or award winning restaurants that Noosa is famous for. Shop till you drop with Hastings St home to a great range of boutiques, home ware stores and art galleries. Your affordable Noosa accommodation is right in the middle of Noosa which means you are only minutes away from Hastings Street, which is sure to become your second home. The Rise Noosa effortlessly takes the beach shack apartment to a whole new level of luxury, it uses the surrounding landscaping with ponds, pools and waterfalls to create a calm resort atmosphere. This resort is made up of 39 two and three bedrooms, fully self-contained apartments that will give you the perfect beach holiday. Relax in the 20 metre heated wet-edge swimming pool which features cascading streams and waterfalls, secure parking, free wireless Internet, jacuzzis, a tour desk and is just a short walk to everything you need on your Noosa holiday. Ring us today to make your holiday booking, you’ll be glad you did. At this Noosa holiday accommodation you have the choice of a different range of luxury apartments, townhouses and penthouses that will suit everyone. Choose from a two or three bedroom apartment, townhouse or penthouse and enjoy all the luxury and comfortable furnishings and fittings that you would expect from a holiday resort. The apartments in this luxury holiday accommodation Noosa are all fitted with Miele kitchens, stone floors and glass sliding doors with large balconies to accentuate the spectacular views. The town houses are spread over two levels and both bedrooms open onto a private courtyard. The penthouse apartments are positioned at the top of the hotel to take full advantage of those stunning vistas, the main bedroom contained a spa/dressing rooms separated by a glass feature wall. Each one of these holiday apartments feature air conditioning, cable television, laundry facilities, fully equipped kitchens, free Internet access, iron and ironing board and balconies with outdoor furniture. What more will you need on your luxury family holiday? Just a short 400 metre walk will bring you to the Noosa’s main beach and Hastings Street where you will love to spend days on your Noosa holiday. Shop till you drop, enjoy award winning dining, surf, swim or just relax on the beach. Of course you can also take in the stunning scenery of the Noosa National Park, visit a local market, head up into the Sunshine Coast hinterland, visit Fraser island, Australia Zoo or Underwater World SeaLife. Wow..this is the ideal holiday, so much to see and do on your Noosa holiday and fantastic Noosa holiday accommodation to enjoy. Ring us today to make your holiday booking. Two hours north of Brisbane you will find ideal Noosa accommodation apartments offering everything you have ever dreamed of for your beach holiday. Effortlessly and beautifully designed and furnished this luxury accommodation in Noosa will give you and your family a memorable holiday that will be talked about for years to come. This Noosa resort accommodation is in such a perfect location that you can easily access all the adventures and attractions that the Sunshine Coast has to offer its visitors. Head up into the hinterland and admire the view of the Glass House Mountains, explore the country towns of Maleny and Montville and all their charms, with boutique shops, art galleries, bookshops and great coffee. A visit to Eumundi markets is a must. The markets happen twice a week and the atmosphere is infectious, you will leave with smiles on your faces and a car full of local produce. You could also do some walks around the Noosa national parks, discover hidden bays and secluded coves. Another day trip that the whole family will adore is Fraser Island, the largest sand island in the world. This world heritage listed island features over 100 freshwater lakes, stunning beaches and ancient rainforests, a day spent on this island will feel like a dream come true. What are you waiting for? 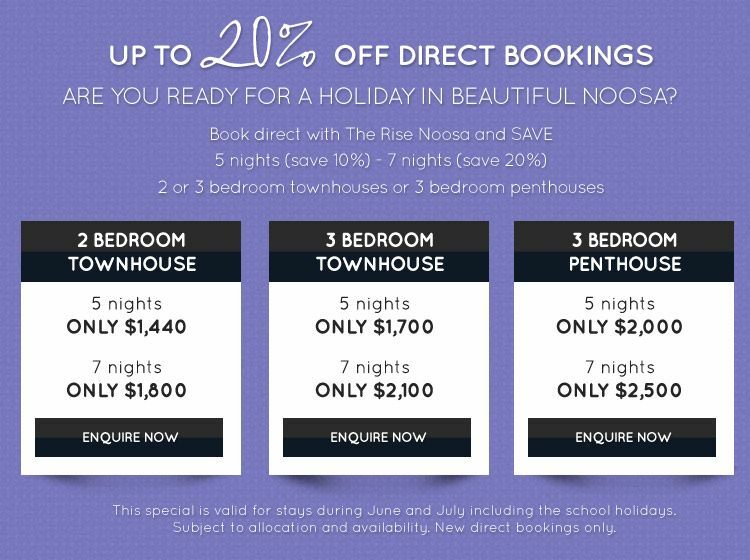 With holidays just around the corner ring us today to book your Noosa accommodation apartments at The Rise Noosa…you won’t be sorry. This Noosa Beach accommodation is the perfect accommodation choice for your next holiday. Capturing the sophistication with luxury and lavish interiors this resort is also laid-back, reflecting exactly what Noosa is known for. Situated within walking distance from the best things that Noosa has to offer, you could be at the beach or the river within minutes. It is safe to say that Noosa holiday spent at this luxury accommodation in Noosa will be a water lovers dream; with an abundance of water activities to do on the river and the beach. Try your hand at kayaking, paddle boarding, sailing, jet skiing or surfing. Or if you want something a little more chilled, then you can simple swim or fish off the banks of the Noosa river or splash in the calm waves of Laguna Bay. The beautifully designed and stylishly furnished apartments are the epitome of Noosa, as are the tropical landscaped gardens with the heated swimming pool and waterfall features. This Noosa Beach accommodation with its friendly staff and prime location are sure to make your next holiday to the Sunshine Coast unforgettable, you will be talking about it for years to come. We are sure that you will come back to this resort again and again because of just how special that first experience was here, spending time with your family and exploring the region. You will find everything about a holiday at The Rise Noosa to be unique and magical; a walk along the beach or even an evening meal on the river as the sunsets. Book your Noosa Beach accommodation today and experience the magic. The Rise Noosa offers the perfect Noosa Accommodation,with friendly and helpful staff and spacious apartments it offers the makings of the ideal holiday. Enjoy a central location, which is within walking distance to Hastings St, the Noosa National Park and Noosa’s Main Beach, everything you need for your holiday is at your fingertips. This architecturally designed Noosa resort has wonderful on site facilities which include a 20 metre wet-edge swimming pool with waterfalls and streams all set in beautifully landscaped tropical gardens. Other resort features include secure car park, free wireless Internet access and a Jacuzzi that the guests can all enjoy. Book your Noosa things to see and do at the onsite tour desk, which is here purely to help you plan and offer advice on the best activities for your holiday. Our staff will advise you on the trips that are most highly recommended and which ones will best suit your family. This accommodation in Noosa is so well located that you are just a 400 metre stroll to the beach which also means you are close to Hastings Street. We are sure that you will end up spending a lot of time on this street; it is lined with world class restaurants, cafes, bars and boutique shops so everyone will enjoy a day spent here. Treat yourself and your family to a delicious meal on the beachfront or head into Noosaville and experience dinner on the riverfront, it will be unforgettable. Choose from a great range of fully furnished 2 and 3 bedroom apartments, townhouses and penthouses perfect for your accommodation needs. Ring us today to book your Noosa accommodation for your next Sunshine Coast holiday.